PopSci reports the first horses to roam the planet 55.8 million years ago were the size of a small house cat. Interestingly, the species got even littler as a result of global warming, and started to become bigger when the Earth cooled down a bit. Full details over here. 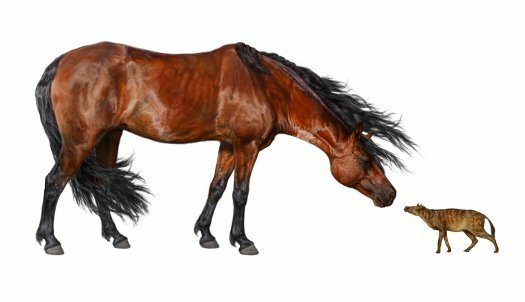 Back in the day of the first mammals, horses started out the size of house cats, weighing about 8 pounds and standing only a few inches tall. Then they got even littler, a direct result of the warm temperatures that characterized the Eocene era. Only when Earth cooled down a bit did the beasts get big, according to a new study — the first evidence that temperature directly affects body size. Interesting results when you think about rising global temperatures. Are Earth’s animals about to undergo a New Shrinkening? About 56 million years ago, the Earth warmed up during a phase known as the Paleocene-Eocene Thermal Maximum, or PETM. Carbon dioxide increased and global average temperatures rose by about 5 to 10 degrees Celsius. At least in horses, body sizes went down as temperature went up. The little horse in the picture above is called Sifrhippus sandrae, and he is the earliest known horse. The species probably came to North America and Europe from a high-latitude land bridge that opened during the warming phase. After its arrival, its body size shrank by 30 percent over the next 130,000 years, Secord and colleagues say.